The small and large XCubes available at CitySport are innovative functional training stations that shift away from the traditional gym experience. 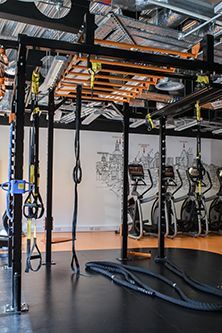 This apparatus, which can accommodate several people at a time, features a variety of accessories such as battle ropes, Olympic rings, bungees, TRX suspension trainers, monkey bars and medicine ball racks. They allow users to perform traditional bodyweight exercises such as pull-ups, monkey bars and inverted rows.